Nancy Neiderer, RN of Parva Plastic Surgery shares her thoughts about common misconceptions about diVa Vaginal Laser Therapy, helping patients to better understand what to expect from the non-surgical procedure. 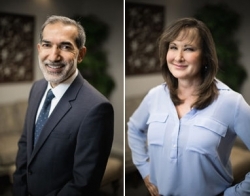 Leesburg, VA, March 06, 2019 --(PR.com)-- As part of his commitment to help patients improve their overall well-being through cosmetic and reconstruction surgical procedures, Leesburg plastic surgeon Behzad Parva, MD offers the innovative diVa® Laser Vaginal Therapy procedure by Sciton®. Performed by the practice’s laser specialist, Nancy Neiderer, RN, BSN, this non-surgical vaginal rejuvenation treatment utilizes hybrid fractional laser technology to improve vaginal health and wellness. Nancy says diVa has been known to correct symptoms such as vaginal dryness, lax tissues, decreased sensation, and urinary stress incontinence. She also notes, however, that despite the procedure’s many benefits, patients often have misconceptions about what it involves. To help educate women on what diVa Laser Vaginal Therapy can realistically offer, and what the process entails, Nancy is revealing the truth behind five common myths surrounding the procedure. Myth #1: diVa Laser Vaginal Therapy will be an embarrassing procedure. Women tend to feel self-conscious about their intimate problems, but Nancy notes these issues are experienced by many women on a regular basis. With the right professional who offers the utmost privacy in a comfortable, safe setting, Nancy explains diVa therapy can actually provide relief from their concerns. Myth #2: diVa Laser Vaginal Therapy is only for older women who have had kids. While a large percentage of diVa patients are women who have had children and/or undergone menopause, Nancy says the treatment can be beneficial for younger patients as well. She clarifies, as long as they are presenting with the indicated vaginal concerns, treatment with the diVa laser system can typically help. Myth #3: diVa Laser Vaginal Therapy is painful. Since diVa therapy is a non-surgical treatment, Nancy says the process produces minimal discomfort, and her patients report feeling only minor pressure. In addition, the diVa procedure can be completed in just three to seven minutes, making it an incredibly quick, safe and precise process. Myth #4: diVa Laser Vaginal Therapy requires a recovery period. Among the many benefits that diVa Laser Vaginal Therapy offers, Nancy informs patients they should be able to return to their schedule immediately after their treatment session. She says there is little to no downtime necessary, so our patients with very busy lives find it convenient to schedule their procedure at Parva Plastic Surgery. Myth #5: diVa Laser Vaginal Therapy can improve the look of external genitalia. The diVa system is designed to treat the vaginal canal and does not affect the intimate area’s outward appearance. To achieve improvement in the external genitalia with diVa technology, an attachment known as diVaTyte™ is required, which is a separate procedure that is not presently offered at Parva Plastic Surgery. According to RealSelf.com, diVa Laser Vaginal Therapy has achieved a 100% “Worth It” rating in 2019 by patients who have undergone the procedure. This makes it the highest-rated non-surgical treatment on the online resource, denoting the procedure’s impressive satisfaction rate. At Parva Plastic Surgery, Nancy says diVa laser Vaginal Therapy has become an integral part of the treatment options for women. She takes pride in her ability to help women by restoring their vaginal health and wellness, ultimately improving their quality of life. At Parva Plastic Surgery, board-certified plastic surgeon Behzad Parva, MD offers a wide range of procedures, including breast reconstruction, breast augmentation, liposuction, and the comprehensive mommy makeover. Working alongside Dr. Parva, Nancy Neiderer, RN, BSN has nearly two decades of experience as a cosmetic injector and laser specialist. The team is committed to providing professional plastic surgical care while educating patients and developing a personal connection with each one.